Press the mixture evenly into the bottom of an ungreased 9x13 pan. Bake for 10-11 minutes. Remove crust from the oven and let cool. 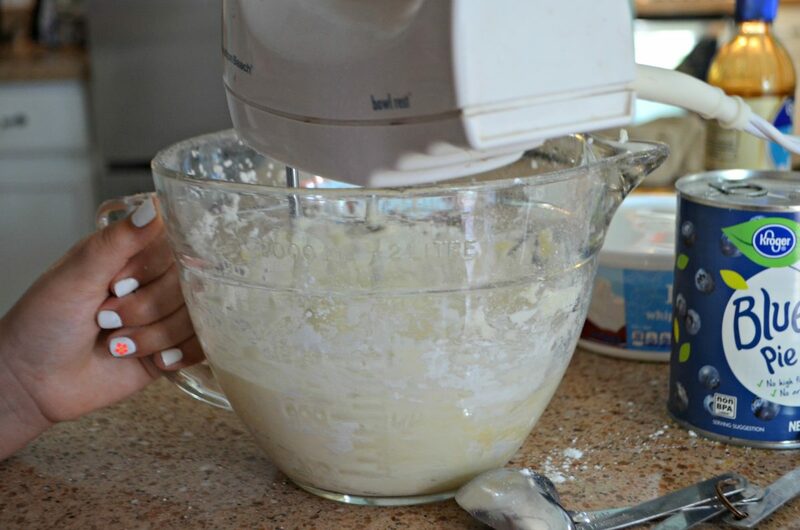 Meanwhile, use a hand mixer to mix together cream cheese, powdered sugar, vanilla extract, and lemon juice. 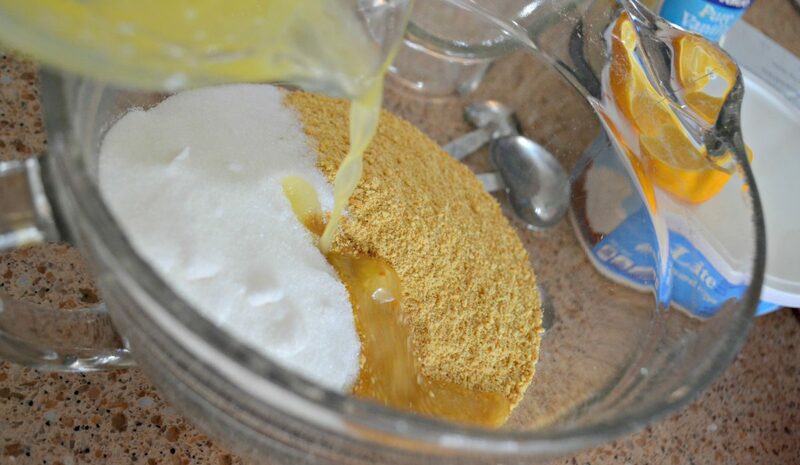 Spread the mixture evenly over graham crackers. Looking for a winning make-ahead dessert idea? Sweet dreams are made of this! 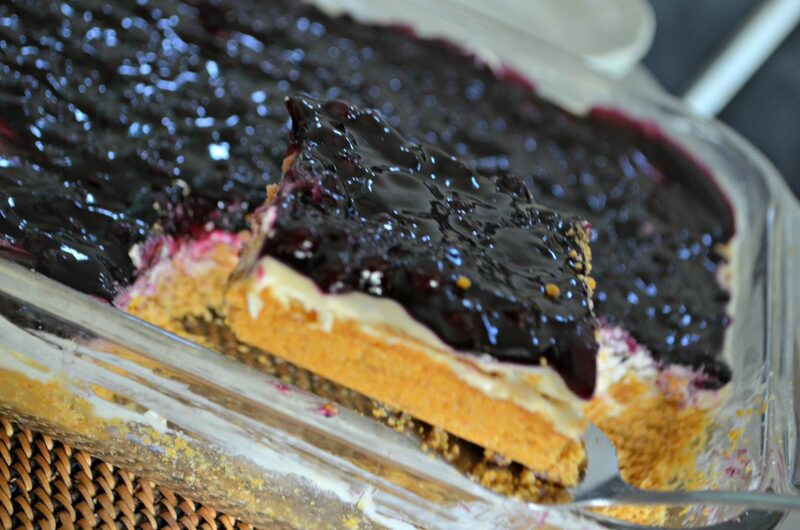 You’ve gotta try this creamy blueberry cheesecake dessert! It whips up in just a few minutes and is completely delicious and addicting. I love portable desserts that you can easily make in a 9×13 casserole dish ahead of time and take with you to any potluck or special occasion. This is a definite must-try crowd-pleasing idea! In fact, this is such an easy idea, my ten-year-old basically made this by herself! I love that these ingredients are easy to find and can be tailored to your family’s tastes with different pie fillings like strawberry (or you could even use crushed pecans for a gluten-free nut crust!). 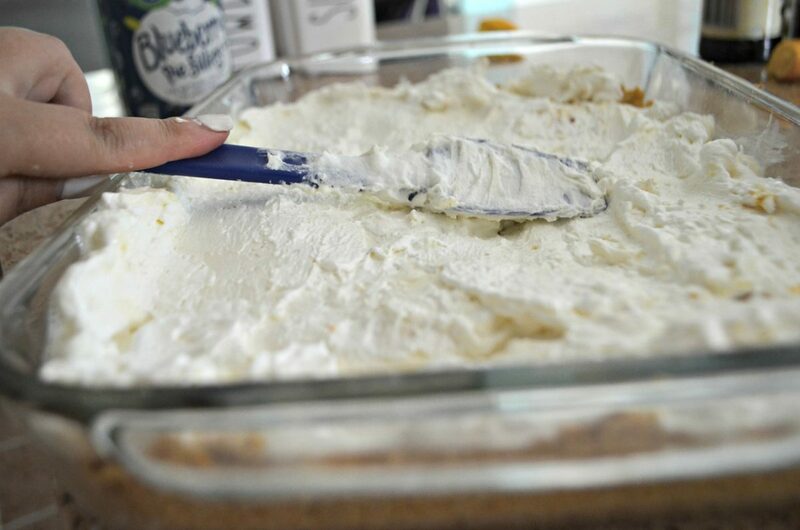 Plus, if whipped topping isn’t your favorite, substitute with a few cups of homemade whipping cream instead! Hip Tip: Don’t have powdered sugar? Make your own with this genius powdered sugar hack! 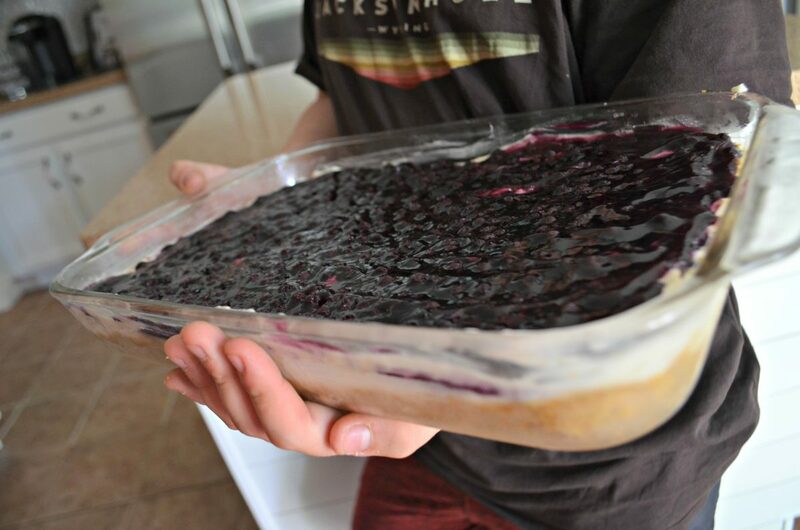 Your family will enjoy this easy, delicious blueberry cheesecake dessert! This is such a great-tasting cheesecake dessert! It has that perfect graham cracker crust, creamy center, and berry topping people want from a cheesecake, but with the simplicity of a bar cookie. I’m definitely making this again soon! It was, dare I say, berry delicious. I’m pregnant and hungry all the time. This looks amazing!! Thanks for the recipe. Yummmm!!! Thanks for sharing. I always love the recipes shared here! Awesome! I bet that’s yum. Throwback to the 1970’s when my mother used to make this for family gatherings. What’s old is now new again!! I AM THAT OLD!!! LOL! I think about that too:) Delicious, simple recipe. I use unsalted butter & sometimes I add some finely ground nuts to the crust. Anything to sub for the whipped topping? I typically don’t use that or whip cream. Nin you could use CocoWhip Dairy-Free Whipped Topping. I’ve never used it but it definitely looks like it’s worth trying. Oh my goodness this looks so good ugh I want a piece of this cheesecake bar . Will be making this this weekend. Mixed berries sound awesome. I like to make desserts like this in those metal throw away pans from the Dollar Tree so I don’t have to worry about it if I go to someone’s home and one less dish I have to wash. Thanks for an awesome refreshing dessert. Oh my I’m drooling here!!! Def pinning to make this weekend! Have everything except for Graham crackers, so adding to my grocery list!! I was digging through the freezer the other day and came across 2 containers of Cool Whip that are getting close to their exp date and wondering what I could make with them. So 1 dessert and the other for Pudding pops! Thanks, I was looking for a gluten-free crust alternative! Of course! Cherry filling or strawberry would be great! I make something similar, but use Nigella’s no-bake cheesecake recipe (the BEST no-bake version I’ve ever found) and Martha Stewart’s blueberry topping recipe. It’s always a hit! Nigella has a few no-bake cheesecake recipes…which one do you make? You can use this same recipe to make individual mini-cheesecakes to bring to parties. It’s even easier because there is no baking of the crust. You literally use a Nilla wafer in the bottom of a cupcake liner. Make sure you use a cupcake tin so the mini-cheesecakes keep their shape while setting in the fridge. Top with any fruit topping you like. Cherry is my favorite! 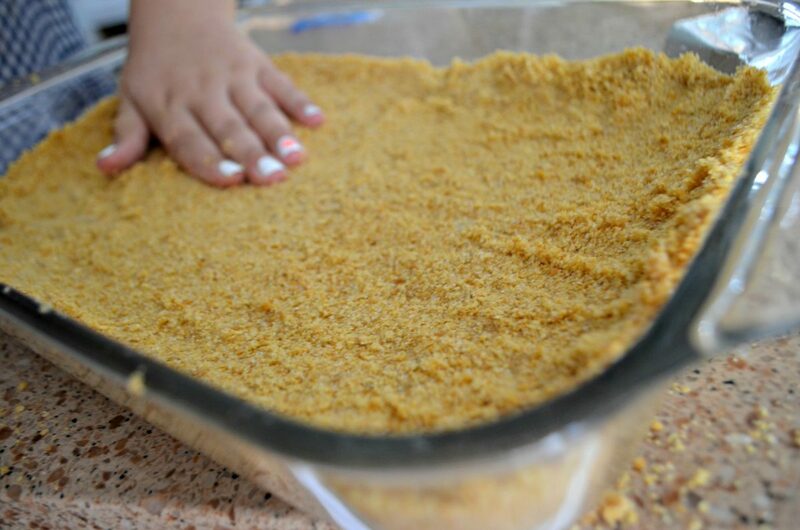 My mom used to make this to bring to parties when I was growing up. Now I make them. Always a hit! 4th of July coming up before we know it. This would be great with red, white, and blue such as strawberries or cherries and blueberries with the white peeking through. Got one of my dishes planned. Thanks so much for all of the ideas, all! How would this be to freeze for unexpected guest and would it thaw out like I just made it? Yes I think so, especially if you use whipped topping. I think it’d freeze great if covered well in freezer! I this this would be cute to make into individual cups, but with blueberry & strawberry or cherry filling for the 4th of July! Yes so fun and delish! How can I print this without the pictures? With them it is 8 pages. Made this for dessert tonight and everyone thought it was sooo good! If you don’t like the actual filling, can you just add fresh blueberries to the top? Yes I’m sure that would work as well! Hey Lina! I made this cheesecake and it is delicious. I am not a baker at all, but this made me feel like one! 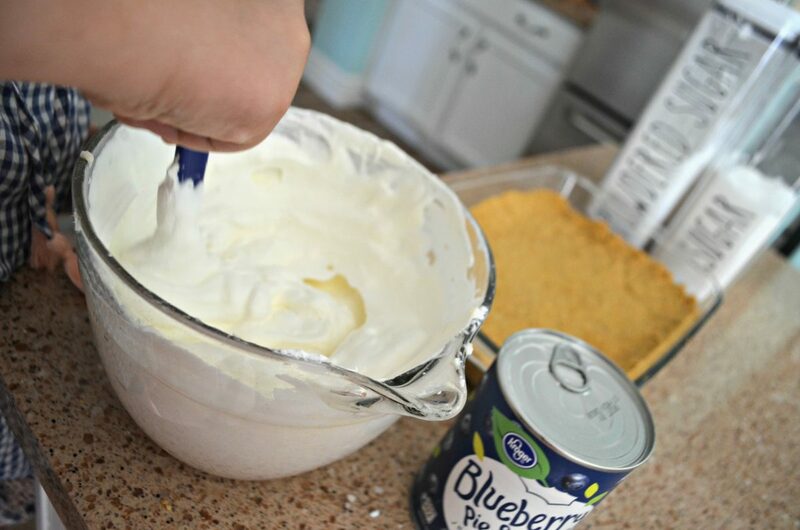 Super easy and I love the hint of lemon in the cake. Thank you!! OH my gosh! Thanks for the sweet comment and so funny I’m making this tomorrow for a cook out also! 👍YUM. Hi, love this recipe! Sounds delicious and easy, my kind of baking, lol. My question is this.. Is lemon extract the same as lemon juice? Oh sorry and thanks for the feedback!